Sometimes going for a long walk or a trip to the park just isn’t possible. When you are sick, snowed in, or the temperature skyrockets, finding ways to exercise your dog indoors takes a bit of creativity. 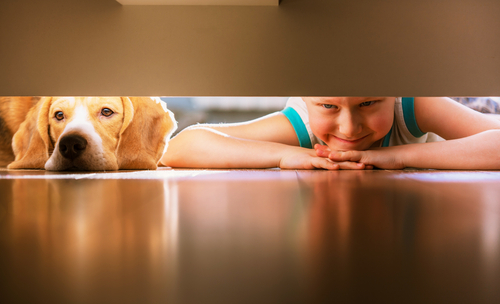 The next time you find yourselves trapped inside, keep your pooch from going stir-crazy with one – or more – of these fun indoor activities. Some dogs need more than just a leisurely stroll to stay happy, fit and healthy. Dog trainer, Melissa Heeter says treadmills not only provide excellent cardio workouts, they also allow you to control the terrain, eliminate distractions, and curb boredom-induced behavior problems. Best of all, they can be used no matter what Mother Nature is up to outside. You do not have to have a special doggy treadmill to take advantage of this indoor exercise opportunity. “Human” gym equipment will do just fine as long as your dog fits and is properly trained to use it. Typically, a 45-pound dog will need a 55-inch treadmill belt. If you have a large or giant breed pooch, you can find specialized treadmills for dogs on sites such as Dog Tread and Jog a Dog. 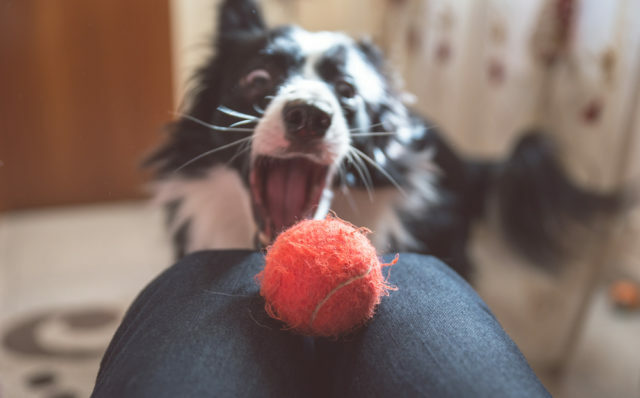 It may be the most basic form of canine entertainment, but that doesn’t change the fact that dogs love to fetch! Long hallways are great for tossing a favorite toy or ball, but you can also get creative. Try using the stairs or placing “jumps” made of couch pillows in your dog’s path to increase the difficulty. Clear out the living room, it’s time to turn your house into an indoor exercise center! Create your own makeshift obstacle course by placing broom handles across chairs for jumps; blankets over the spaces between furniture for “tunnels”; and evenly spaced plastic bowls for cones! If you’d rather not use your own items, you can also purchase an indoor agility set for just such occasions. Not only will Hide & Seek exercise your dog’s body and mind, it will also help teach (or reinforce) his recall training. When it comes to this indoor activity, the-more-the-merrier, so be sure to include the whole family. 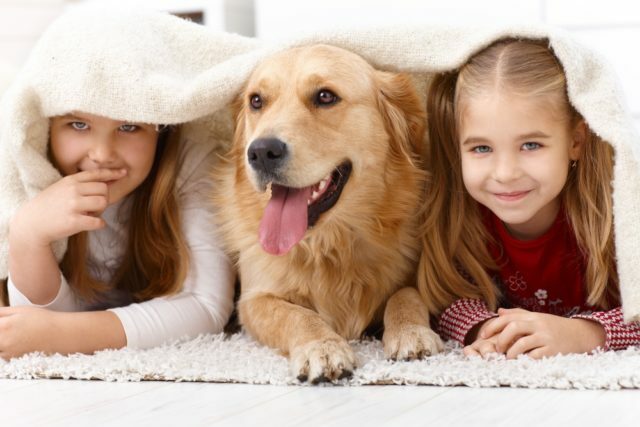 Have your dog sit and stay while all human participants hide around the house. When ready, holler for your dog to come find you! He will have a blast trotting through the house and hunting each of you down. Make sure everybody has a pocketful of healthy treats or gives him lots of love and praise when they are discovered! 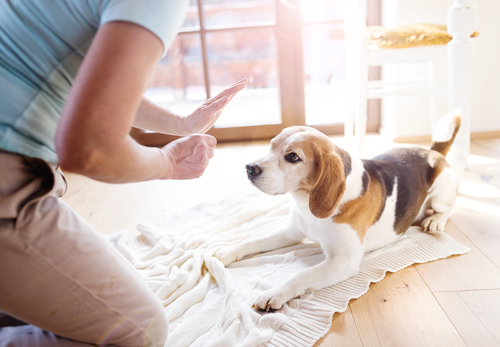 Dog parents often list lack of time as a reason they fail to train their dogs. Take advantage of your day indoors to work on basic commands or add a few new skills to your pup’s bag of tricks. Training expends mental and physical energy, builds confidence, and strengthens the human-animal bond. And, of course, you get the added benefit of a well-adjusted pup! 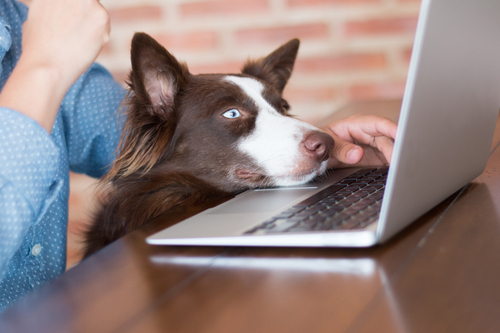 If you are not sure where to begin, try going online to CyberDog or E-Training for Dogs. These sites offer professional classes, webinars and individualized coaching. Those with previous experience can also find an array of how-to training videos on YouTube. Anyone who has ever climbed aboard the StairMaster at the gym knows stairs make for a great cardio workout! 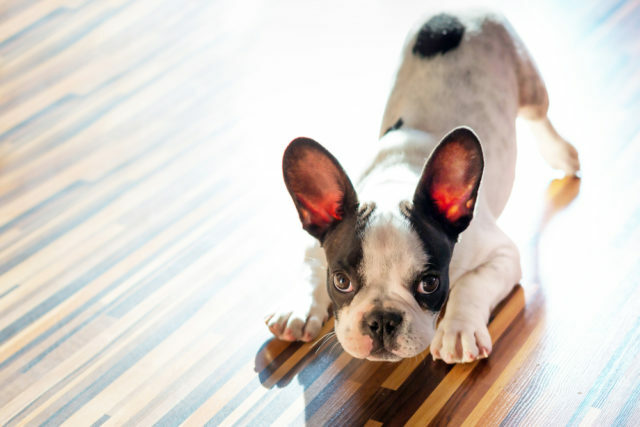 If you have carpeted steps in your home, take advantage of them to tire out your stir-crazy pooch. You may have to join in the fun in order to motivate your dog, so make sure both you and your pup are healthy enough for this type of indoor exercise. Nose work is one of the hottest sports for dogs and their owners to participate in together. Based on the techniques used to train professional detection dogs, it involves putting a pooch onto a specific scent and sending them through a course to search out the source. The sport of scent training has many levels of complexity, but the basic task of sniffing out desirable objects comes naturally to dogs. Simply hide a few favorite treats around the house, introduce the scent, and send your pup scampering off to find them! For an extra challenge, use a series of boxes or bowls he will have to flip in order to collect his rewards. If going outside is not an option, this is an excellent indoor activity for the canine body and mind. Puzzle toys come in all shapes, sizes and skill levels. Some are stationary and can be solved without much physical activity. Others, like the PortoBallo™ by Project Play™, are designed to get your dog moving and working for his prize. 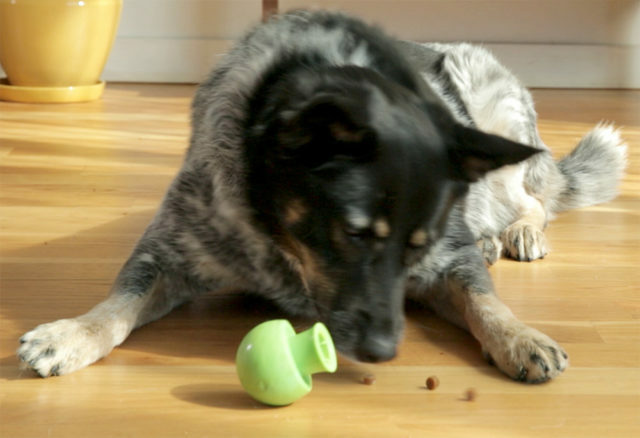 Rather than loading this stuffable, chuckable, oddly-shaped bouncy toy with treats, fill it with your pup’s kibble so he can run, jump, play and work for his dinner! 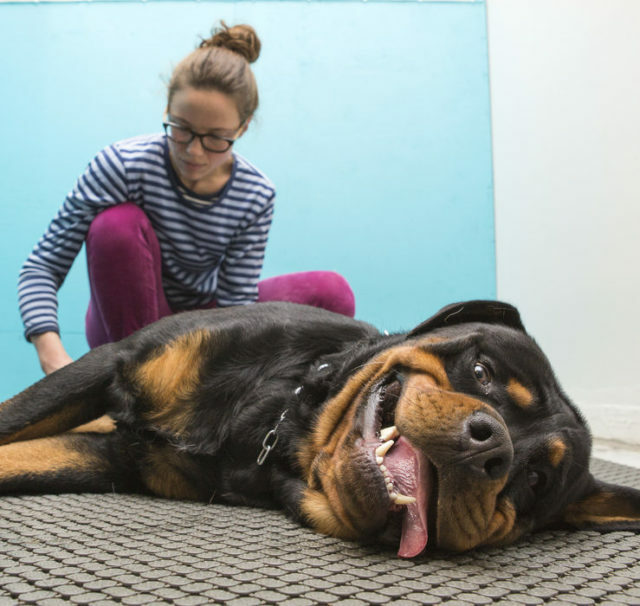 Canine conditioning is sort of like Zumba for dogs! It involves exercises to strengthen muscle, improve balance, and sharpen agility. While most commonly used for pups involved in competitive sports, any healthy, high-energy pooch can benefit from its techniques. Some of the exercises can be performed at home, such as walking on a 15-45% inclined and declined treadmill for 5-10 minutes each, and the “Stand-to-Down/Down-to-Stand” exercise. Should you decide to get more involved with conditioning, you can purchase equipment from FitPaws USA or sign up for an online course. While massage certainly does not count as exercise (don’t we wish! ), it is extremely beneficial for your pup’s health, flexibility and circulation. Doggy massage increases oxygen flow to the blood, relieves pain and muscle tension, alleviates anxiety, and can even improve immunity. It should also help relax your tireless, house-bound hound!